Im having some issues with tall pine trees and their billboard LOD completely disappearing at angles when looking down at them from above. All settings are default. Any idea what I can do to fix this? The issue isnt a problem at ground level, but out game will have areas looking down onto trees and from above, so obviously this is far from ideal. Ive attached a video of the issue. You don't want to use billboard threshold with v8 trees since they include the top-down billboard and they require different thresholds. So leave it at 1. Instead, make sure to use the SpeedTreeCrossfadeBillboard node in the material. The importer should set this up for you, but if you didn't use that you'll need to do it yourself. 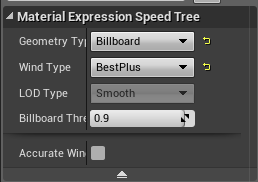 I haven't personally seen problems with it so far, but if you do need to tweak the thresholds used, double click the SpeedTreeCrossfadeBillboard (which is a material function), and edit the two numbers in the lerp node. One is for horizontal, and one is for vertical. They are set up for the default 8+top images the UE4 exporter normally exports. I had originally set my billboard threshold to 1 since I did find it looked better with the trees, but changed it back to default values once I noticed the issues I was having. I ended up exposing the vertical and horizontal values in the material function to my material instances so I can tweak them per instance and that seems to have done the trick. Thanks!